As overall Chicago transit ridership continues to increase, CTA buses are experiencing a decline in use. The number of people using Chicago’s bus system fell by 1.8 million rides last year, while the L added over 3.5 million trips. So what’s causing the decline in bus travel? Slow moving busses, long wait times, inadequate station infrastructure and frustrating “bus bunching” all have an effect. These are problems that all bus systems face, but several cities around the world are taking an innovative approach to solving them by implementing bus rapid transit, or BRT. BRT is a low-cost approach to making busses more efficient by creating bus-only lanes on city streets, giving busses signal priority at intersections and offering off-board fare collection. The benefits of BRT aren’t limited to improved transit — studies suggest that communities near BRT routes experience added land value, greater development and economic resilience. In 2005, Los Angeles made a huge investment in its future by opening the 18-mile-long Orange Line. The entire length of the Orange Line provides a dedicated bus-only lane, and all of its stations are outfitted with pre-paid boarding facilities. Trips on the Orange Line operate 30-50 percent more quickly than on conventional LA bus routes, but don’t require the billions in funding necessary to build rail infrastructure. Angelanos have made their support for the Orange Line clear: ridership tripled in its first year of service, and currently 26,670 people take the BRT to work, shop and attend school every day. 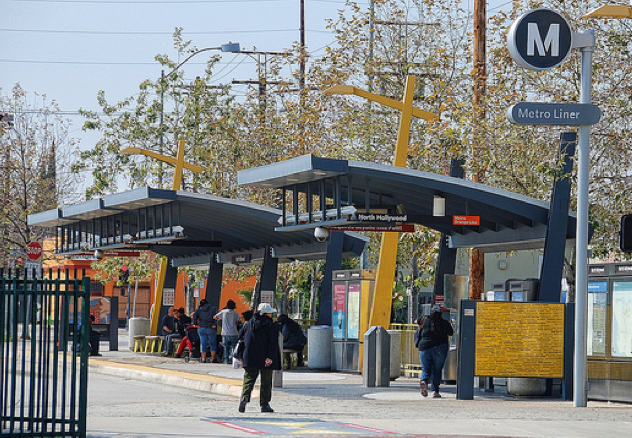 LA is eager to expand on the success of the Orange Line. The city government recently announced a massive expansion to their BRT system, including two new BRT lines, an expansion to connect the Orange Line to the Gold Light Rail Line and increased capacity on the existing Orange Line. Los Angeles is even using the Orange Line as an example of their dedication to great transit in their bid for the 2024 Olympics. Creating a similar type of BRT line that serves many neighborhoods would be a perfect fit for cash-strapped Chicago. If Chicago wants to accomplish the same success as the Orange Line, it’s critical to implement off-board fare payment and signal priority in the Loop Link. The average rate of speed for a bus in the Loop is 3 mph; implementing these changes will speed that up significantly. A BRT route on Ashland Avenue would create a high-speed transit route from Irving Park Road all the way to 95th St and significantly increase economic development along the entire corridor. This blog post was written by Justin Dodd, who serves as an advocacy intern at Active Trans.